The official companion blog for the LHC@Home's Team ITU. Join today, donate your spare CPU cycles - and help discover the secrets of our universe! It's been a busy few years for me, but moreso for the Large Hadron Collider. 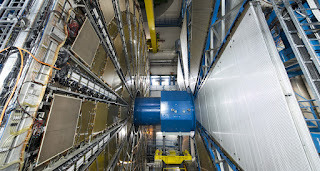 Operating since September 2008, the 27 kilometre long particle accelerator has been furthering science's understanding of subatomic particles for a long time. Thousands of magnets of different varieties and sizes are used to direct the beams around the accelerator. These include 1232 dipole magnets 15 metres in length which bend the beams, and 392 quadrupole magnets, each 5–7 metres long, which focus the beams. Just prior to collision, another type of magnet is used to "squeeze" the particles closer together to increase the chances of collisions. The particles are so tiny that the task of making them collide is akin to firing two needles 10 kilometres apart with such precision that they meet halfway. Basically, this is totally bonkers crazy science, and it's amazing to behold. What have we observed so far? Well, the Standard Model of physics has been further reinforced by LHC findings - every result ever seen in the collider conforms to the Standard Model. We've not found evidence of supersymmetry (SUSY), extra dimensions or direct creation of dark matter. That's not to say they don't exist - I'm inclined to believe in the cyclic multiverse theory - but you can rest easy for the moment, the LHC won't be making the universe implode. 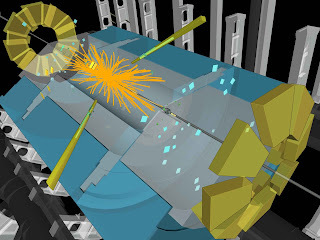 2013: discovery of Higgs boson mediator particle confirmed! Achieving first test collisions is anything but an easy job. It involves round-the-clock checking and rechecking of the thousands of systems that comprise the LHC. It includes ramping up the energy of each beam to the operating value of 6.5 TeV, checking the beams’ instrumentation and optics, testing electronic feedback systems, aligning jaw-like devices called collimators that close around the beams to absorb stray particles and, finally, focusing the beams to make them collide. Each beam consists of packets of protons called bunches. For these test collisions, each beam contains only two “nominal” bunches, each made up of 120 billion protons. This is far fewer than the 1200 bunches per beam that will mark the start of serious data taking and particle hunting. As the year progresses, the operations team will continue to increase the number of bunches in each beam, up to the maximum of 2556. Forbes has a great summary of LHC discoveries to date, and most importantly, what we've not found. In science, observing nothing is just as constructive as a novel finding. As CERN has only recorded approximately 5% of data expected to be collected through the project's lifetime, expect more confirmations regarding our quantum universe. 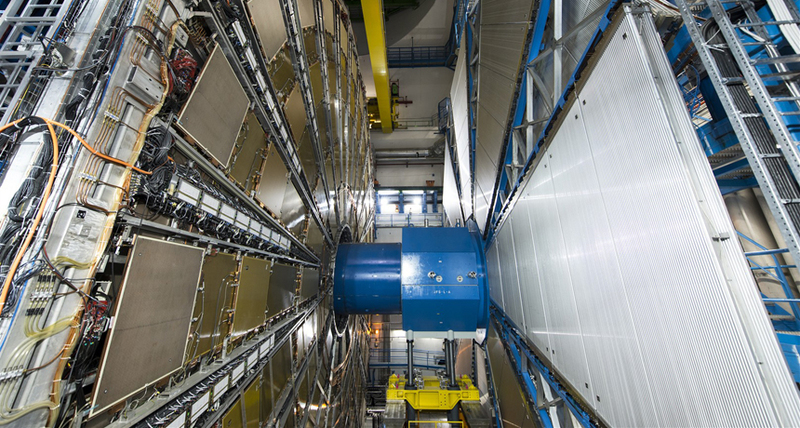 read some amazing facts and figures about the LHC. Higgs Boson discovery may be imminent... Wait, what?! Wired reported today on progress being made at the LHC at discovery of the Higgs Boson. They also futuregaze a bit and declare that formal discovery may even be announced in a few weeks' time... Crazy stuff. Head to http://www.wired.com/wiredscience/2012/06/latest-higgs-rumors/?utm_source=googleplus&utm_medium=socialmedia&utm_campaign=googleplusclickthru for the juicy goodness. And as a sidenote, yikes! the Blogger interface has changed radically since I last posted through it. At the end of January 2011, CERN announced the then-latest developments in the LHC's shutdown work as 'nearing completion'. Not only were they planning to replace some of the crucial supercooled electromagnets responsible for beam control, they've been testing a newly-commissioned power system, POPS, responsible for juicing the PS Booster. Related: click to read a 2003 paper by Frank Gerigk proposing various possible designs for the transfer line between LINAC4 and the PS Booster systems. After just a month of operation in 2011, the LHC has already achieved more than half the total number of proton-proton collisions delivered in 2010. The experiments have accumulated an integrated luminosity of 28 pb-1 this year. Integrated luminosity is a measure of the total number of proton-proton collisions measured by the experiments. The Technology Department is responsible for technologies which are specific to existing particle accelerators, facilities and future projects. The main domains of activities cover: magnets (superconducting, normal conducting, fast pulsed magnets, electrostatic and magnetic septa), their machine integration and protection, power converters, cryogenics, high and ultra-high vacuum systems, coatings and surface treatments. They go on for another page - in a nutshell, everything the LHC does falls under their ultimate purview. Worth keeping tabs on meeting minutes if you want to know the minutiae of running a collider! Large Hadron Collider – Live! The waiting is over. The world's largest, most powerful particle accelerator goes into action this morning. The hunt for new particles, forces and dimensions starts here. The G has a liveblog on their web site which you can set to update every minute. Hello, and welcome to the Team ITU official blog. 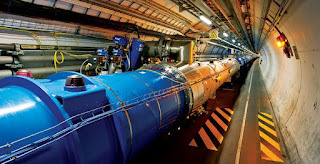 Team Into The Unknown's primary aim is to encourage people to participate in the Large Hadron Collider's Grid project - to look for, amongst other things, the elusive Higgs Boson. If you find this blog interesting, you might want to check out its sister site, Into The Unknown. Cheers! Copyright 2006 onwards Christopher Woods. Some Rights Reserved. Into The Unknown is licenced under a Creative Commons License. (Attribution-Share Alike 2.0 UK: England & Wales, Some Rights Reserved).